I have attended many inspirational courses over the years with internationally known glass artists and I am constantly developing my style. I learnt new techniques about casting small pieces with positive and negative casting. Using wax based clay, models were made and then cast in plaster. 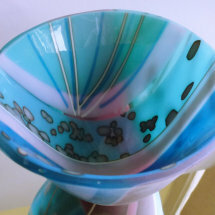 Using moulds glass was added before being fired in the kiln. 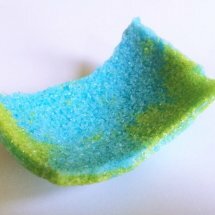 I used frit (crushed glass), scrap glass, sheets or billet (large blocks of transparent glass) to fill the moulds. 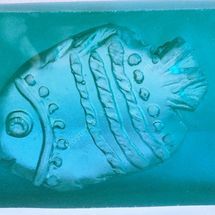 The fish image shown was cast with billet. At this interesting taster course I learnt how to make moulds and use crushed glass to develop vessels. The bowl shape was initially made with clay, then cast with economy plaster. A second coat of plaster reinforced with fibreglass strands was then added to give extra strength. The plaster is kept damp whilst the crusted glass is added around the inside of the mould. When the vessel is fired at a low firing schedule, this produces a sugar or crystal appearance, but if a glassy finish is wanted then a higher firing schedule is used. This one day course concentrated mainly on the photography of glass. We were given techniques in the use of our cameras, lighting, display etc. Simon Bruntnell is a well known and respected national photographer in this field. This 5 day Masterclass focussed on the subtleties and variables of slumping kilnformed vessels and the many coldworking processes to finish the form.I made a range of small and medium vessels to fully understand each process involved. Experimentation in form and colour was encouraged throughout the course. This 5 day Masterclass with Bob Leatherbarrow was intensive and particularly productive. I started with the basics with using powders and over the days became more confident at manipulating the techniques. Bob who is based in British Columbia Canada and works with glass as an artists palette using glass powders to give texture with added colour. A delightfully amusing Masterclass with Corina who had travelled from the US. Constructing frogs, bringing them to life and dressing them up in Scuba diving kits were part of the agenda! Visiting tutor at Mango Beads, Barnstaple, Anita brought an inspirational workshop showing us the basics of Oriental Bead Manufacture. From the simple to the complex bead, round,oval,compressed and freely formed shapes to Oriental Big Wheel Beads, Oriental Lens Beads, Oriental Bead Earrings, Oriental Bead and Disc Pendant. 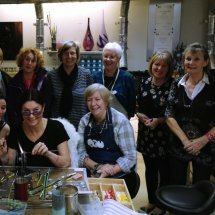 This great 2 day workshop was held at Warm Glass, Bristol and emphasised the use of frits and powders, plus lots of experimentation with the use of flexiglass and glassline pens. Silvia Levenson is both inspirational and generous with her experiences. Levensons work is more about the emotion of a piece than its technical characteristics, for this reason her work is widely collected and highly respected. I attended a one day CGS workshop held at Warm Glass, Bristol focusing on how we as artists can express ourselves and convey our message to others.